Well, it is not as bad as I have heard, but it is nowhere as good as it could have been. Sony Picture’s Venom arrived in the theaters with some big time baggage from negative reviews on Twitter and the internet, and I can certainly see why some people would not like Venom. I am not going to claim that I loved this movie either. In fact, it might be one of those that gets worse the more I think about it, but my initial thoughts were that it was okay, but no great. 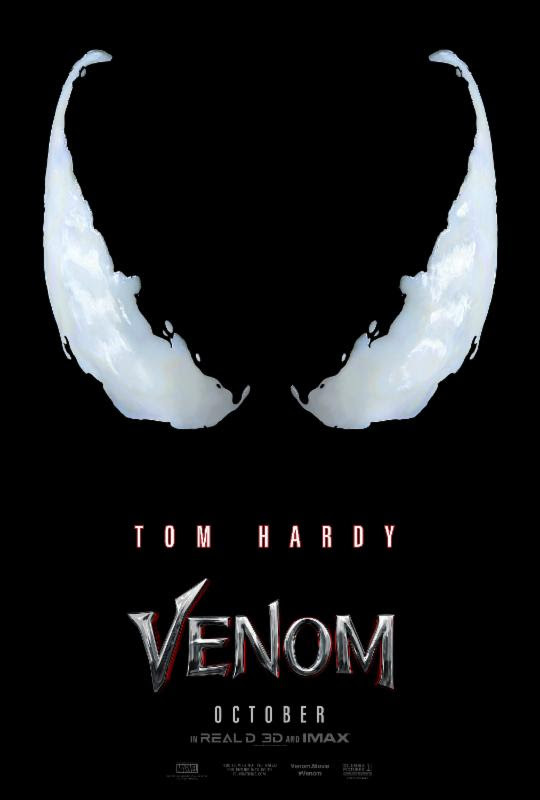 Tom Hardy plays down on his luck reporter Eddie Brock, who loses his job and his fiance after an ill-advised interview with the crooked head of Life Corporation Carlton Drake (Riz Ahmed). Brock’s life takes a strange turn when he bonds with one of the alien symbiotes that the Life corporation were studying and they become Venom. The tone of this movie was unexpected. It was really more of a buddy comedy than it was a horror film, which was what I had expected. That is not necessarily a bad thing, but I am afraid most of the jokes did not hit for me. Hampering the jokes even more was the horrid dialogue that was tearing down this script. There were laughable lines, but not laughable in the funny way. More like the “turd in the wind” way. I will say that, despite its early flaws, I was having a decent time watching Venom for the first part of the film. However, the third act, in particular, went down hill fast and hard and really wasted the good will that I had built up. The third act felt totally rushed. It was nothing more than a sloppy CGI fest between Venom and Riot that was not fun to watch and had little to no stakes. The film tried to pretend it had stakes, but it was absolutely just pretending. Tom Hardy was fine as Eddie Brock, though he did seem kind of whiny at times. His physicality of the role was solid and I did like the interactions between Brock and Venom, despite the lackluster dialogue. There were some really good action sequences in the film, one in an office building and the one where Eddie fights in his apartment. There is a poor car/motorcycle chase scene though that was overlong and was peppered with too many unneeded explosions. Riz Ahmed was a terrible villain, stereotypical and rather boring. Ahmed is way too good of an actor to be placed in a role with so little development. Michelle Williams is also in this movie. She played the worst female character in a comic book movie in a long time. She too is too good of an actor to have this material given to her. I did not believe for one moment in the relationship with her and Eddie. I was actually more interested in her relationship with good guy Dr. Dan Lewis (Reid Scott). I did not mind the origin of this version of Venom sans Spider-man as it seemed at first that Carlton Drake would take that role. However, the film did seem like it was missing something for Venom, a counter balance to him that is perfectly provided by Spider-man. And while it might not be fair to say this, I do think this would have been a stronger movie had Spider-man made an appearance and was tied into Venom’s world. There is really only one post credit scene, as we see the world’s worst wig. At the end of the credits, though, they show an extended clip from Spider-man: Into the Spider-Verse animated film that is coming out in December, starring Miles Morales, and it looked absolutely amazing. Watching that clip, I had a serious sense of wonder that was lacking from Venom. I did leave the theater with a happier feel than I did after Venom was over, so there is that. Venom has its moments where the film was enjoyable, but, unfortunately, there were more scenes where it was pretty dumb. The dialogue was terrible. There were too many talented actors that was not provided a sufficiently weighty role. The third act took the film, that was hanging on by a thread, well off the rails and rushed through to an unearned conclusion. Tom Hardy was good though and there were some good moments (though too many of the best scenes were in the trailer). This Venom was better than the Topher Grace version, but not by much.